Here is why you should call us today! We specialize in manufactured and mobile home plumbing and repairs. 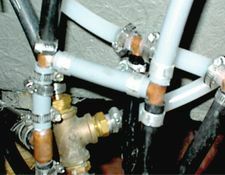 We have over 30 years manufactured mobile home plumbing experience. 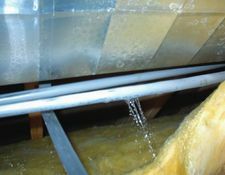 We offer professional quality plumber services at reasonable rates. We are family owned and operated = personalized friendly service! We Provide Water Heater Replacement Code Approved for Manufactured and Mobile Homes in stock. We are specialists in plumbing parts that are typically exclusive to the manufactured and mobile home industry. 1976 to 1996 manufactured and mobile home owners this is information you should know about. 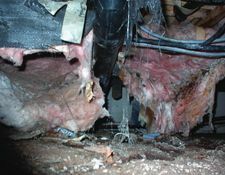 We are specialists in removing and replacing defective polybutylene pipe, with complete repipes, also providing professional repair of damages caused to your manufactured or mobile home, due to the defective polybutylene pipe. Click photos above for more info! Over 30 years experience ... specialists since 1984! We give our manufactured and mobile home customers a commitment to quality service with exceptional value. We are experienced, knowledgeable, professional plumbers. We have many years of specialized experience and the plumbing expertise to get your job done right the first time for you. Our family owned company has been in business since 1984. I have included the following information as brief historical review of how my company was started. I also mention a bit about my extensive experience with manufactured mobile homes. These are some of the reasons why I believe we are your best choice for mobile home service and repair. My start in the mobile home industry goes way back to 1978. While living in Iowa, I received a phone call from my older brother to come and help him with his business, installing mobile homes in Arizona. So I moved in 1978 and was setting up mobile homes all over Arizona. In 1981, I started working for Arizona Mobile Home Supply, a one stop, shop, for the mobile home set-up installers. In 1984, I started, Courtesy Mobile Home Repair and Remodeling. This business took off providing services like roof, ceiling and floor replacement for insurance company’s. Then in 1994, I was contacted and asked if I wanted to professionally repipe manufactured and mobile homes, under the Class action suit against Defective Polybutylene Pipe by CPRC. The company really took off, repiping manufactured and mobile homes throughout Arizona, from Page to Ajo, Yuma to Show Low, and all parts in-between. In fact in 1997-1998, the company was repiping 30 mobile homes a week, with 3 crews. Two of my sons, eventually began managing two of the crews. I later changed the company name to our current Courtesy Manufactured Home Plumbing & Repair. We are still servicing all of Arizona, helping homeowners with the problems of defective polybutylene pipes still existing in their 1976-1996, manufactured and mobile homes and with all the other professional plumbing, repair and remodeling services mentioned on our website. Our goal has been, and always will be, providing quality courteous service to all our manufactured and mobile home customers. Please feel free to check out our BBB rating ... you will not be disappointed! We are licensed, bonded and insured plumbers, so please feel free to check our Lic.# 075608 with the Arizona Board of Contractors where we are publicly listed and in good standing since 1988. We also have many customer service reviews with our service listing on Angie's List ... and we offer a 5% discount to their members! We appreciate your business and look forward to your customer satisfaction and future referrals. If ever there is anything we can do to make your experience better, please just ask! Feel free to contact us with any questions you may have about repairs you may need for your manufactured or mobile home and to request a FREE inspection and estimate if needed! 5% OFF for Angie's List Members. Courtesy Manufactured Home Plumbing and Repair, specializes in manufactured home and mobile home plumber repairs, repipes, water heater replacements. We are licensed, bonded and insured plumbers with over 30 years experience serving the plumbing needs of manufactured and mobile home owners.